Speed has become an absolute necessity for E-Commerce success, as customers are now less and less tolerant of slow website load times. The faster your webstore loads when a visitor arrives, the better. If your overall site performance is slow, the chances of site abandonment rise up exponentially. Your webstore speed and performance translates to conversions. In fact, major E-Commerce brands estimate that every one-second delay in page load times can lead to billions of dollars per year in abandoned sales. Google has indicated that website speed is one of the signals used by its algorithms to rank pages. This means that your website’s speed not only affects conversions but is also important for your search engine rankings. 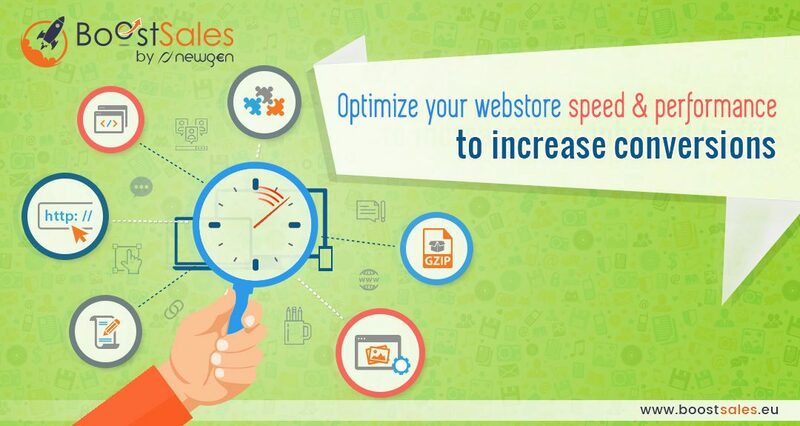 BoostSales by Newgen optimizes merchants’ webstores to make sure that they load faster and convert more customers. Our team designs, develops and upgrades webstores according to industry best practices. In this blog post, BoostSales’ team will list some of the major factors that affect the speed of an E-Commerce webstore and how you can speed up your webstore to gain more conversions. Note: Before continuing with this article, you can check your current website load times by visiting Pingdom, Google PageSpeed Insights or Web Page Test. For an E-Commerce site, good quality images play a crucial role – from sales banners to product images. But if those images take too much time to load or their quality is not up to the mark, there are more chances of visitors abandoning your site. Merchants could use third party tools such as Kraken.io and TinyPNG to dramatically compress their images with lossy or lossless compression for quicker loading times. It is possible to bulk optimize your webstore images by using API integrations or extensions. All major E-Commerce platforms like Magento, WooCommerce and Prestashop offer image compression extensions such as Apptrian Image Optimizer, ImageRecycle, WP Smush, EWWW Optimizer and PrestaSpeed to name a few. You can also utilize APIs for both Kraken and TinyPNG to automatically submit your images to be compressed. Try to ensure that the size of product images does not exceed 100KB each, to prevent the visitor from having to wait long to view the product while browsing. When possible, use the same images throughout the website as much as possible (say for a particular product or sales offer image), so that users only have to download each image once and their browsers can then display the image from the browser cache. Optimize the image format: JPEG works best for photographs, which could be easily compressed and made progressive. PNGs render lossless, “flat” images well. Base64 encoded images reduce additional HTTP calls to your web server and can be used for icons and common design assets. SVGs work great for vector images and HTML5 animations. Avoid certain formats like TIFF and BMP, which could dramatically increase the loading speed of your website. Use WebM or MP4 instead of animated GIFs for significant size savings. Set decently long expiry dates these cached files so that they will be stored in the visitor’s browser and updated at regular time intervals (e.g. a time limit of at least 7 days). When a user visits your website before the expiry date, the cached files will immediately be fetched from their own browser cache. It is crucial to use a Content Delivery Network (CDN) that will host your files across a large network of servers around the world, thus ensuring faster website download and rendering times for your visitors. Note: To see whether your files are cached, examine your website in Redbot to access the cache summary. Methodically deactivate or delete unnecessary plugins and extensions. Integrating too many non-essential or harmful plugins will slow loading speeds and can even drag your site down, simply because a vast amount of them would cause a huge drain on your server’s resources. Avoid plugins that load a lot of scripts and styles, or that perform lots of remote requests. Also, make sure that you update installed plugins and extensions regularly. Optimize plugin loading in order to reduce the overall page loading time. To save unnecessary scripts from loading, choose to run the plugins’ scripts and styles on specific pages only. Tip: Try deactivating your plugins one by one to test server performance instead of deleting them in one go. When your web page is loaded in a browser, the browser sends an HTTP request to your web server. This process is repeated every time there’s a request for a new element, and thereby affects the loading time of the website. Small images can be combined into CSS Sprites, in order to cut down the number of HTTP requests. For example, combine icon images into a CSS Sprite, which will let the browser download 1 image instead of 6. In this way, the page will load and render faster. For the remaining images, make sure that you use well-compressed images. Each CSS or JS file you use for your website calls for separate requests, hence adding time to your page load speed. Consider combining two or more CSS or JS files together. Keep your image file sizes to a minimum. Use different image dimensions to suit mobile views, with separate images being served for Retina displays. Replace interactive elements such as animations or videos with static elements like images and sliders on your mobile web pages in order to reduce load times. Prioritize the above-the-fold content (the content that is visible first as soon as your site loads) by making sure that the top content of home page loads first, followed by other elements. The user experience of a website, including its speed and performance, is the ultimate factor affecting conversion rates. Your webstore’s loading speed can make or break the success of your brand. A faster site will provide a better user experience to your customers, which will ultimately lead to increased conversions and inbound traffic. Keep a track on your webstore speed on a regular basis to ensure its performance remains consistent in the long run. Get your website speed optimized by BoostSales today!